In 2000, the U.S. government removed barriers to global positioning system signals, making it possible for civilians to track location precisely. 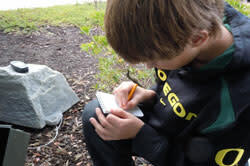 Within 24 hours, the first GPS stash, now called a geocache, was hidden in Beavercreek, Oregon by Dave Ulmer. He posted the cache&apos;s coordinates online with the instructions to "Get some Stuff, Leave some Stuff!!" and within three days, several people tracked it down, did just that, and shared their experience online. The game began. Today geocaching is an international phenomena with millions participating. The company Groundspeak was created to manage the hub for all this activity. 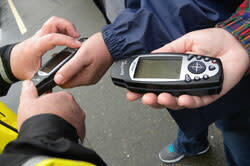 Select a cache you want to find and plug the coordinates into your mobile phone or a handheld GPS. You may find it helpful to download the Geocaching App ($9.99) on your mobile device if your geocaching adventure is a ramble out of the range of cell service. While seeking the cache, explore the new places and sights along the way. Exchange trinkets if you wish, record your find in the cache log book and online. Geocaching is a family-friendly activity appealing to multi-generations and great for corporate team building. 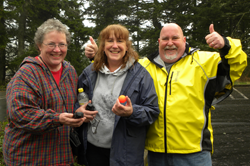 Geocaching relies on volunteers, players&apos; cooperation and etiquette to keep it going. Geocachers also pride themselves on environmental stewardship and adhering to local laws and customs. Caches should be placed in safe, accessible locations. Any missing, illegal or inappropriate caches should promptly be reported to Groundspeak. For additional pointers and F.A.Q. read Geocaching 101 or stop by the Adventure Center in Springfield for assistance. Once you start geocaching, you&apos;ll see the world around you in a whole new way!